Contributing causes confirmed through Innocence Project research. Actual numbers may be higher, and other contributing factors to wrongful convictions include government misconduct and bad lawyering. "The annals of criminal law are rife with instances of mistaken identification." The Michigan Innocence Clinic was the first clinic of its kind to work on non-DNA exonerations. Our work has revealed particular circumstances far too often seen in cases of wrongful conviction. These cases show us how the criminal justice system is in need of much repair and how the Michigan Innocence Clinic can combat troubling trends of the system. In each case we have worked on, we have uncovered overlapping causes of wrongful convictions. Eyewitness misidentification is the single greatest cause of wrongful convictions nationwide. Research shows that the human mind is not like a tape recorder; we neither record events exactly as we see them, nor recall them like a tape that has been rewound. Instead, witness memory is like any other evidence at a crime scene; it must be preserved carefully and retrieved methodically, or it can be contaminated. Many forensic testing methods have been applied with little or no scientific validation and with inadequate assessments of their significance or reliability. As a result, forensic analysts sometimes testify in cases without a proper scientific basis for their findings. And in some cases, forensic analysts have engaged in misconduct. In many cases, innocent defendants make incriminating statements, deliver outright confessions, or plead guilty. Regardless of the age, capacity, or state of the confessor, what they often have in common is a decision—at some point during the interrogation process—that confessing will be more beneficial to them than continuing to maintain their innocence. In some cases, government officials take steps to ensure that a defendant is convicted despite weak evidence or even clear proof of innocence. Often, statements from people with incentives to testify—particularly incentives that are not disclosed to the jury—are the central evidence in convicting an innocent person. People have been wrongfully convicted in cases in which snitches are paid to testify or receive favors in return for their testimony. The failure of overworked lawyers to investigate, call witnesses, or prepare for trial has led to the conviction of innocent people. These factors are not the only causes of wrongful convictions. Each case is unique and many include a combination of issues. ¹Some content reproduced from The Innocence Project website. Figures are percentages of total known exonerations. 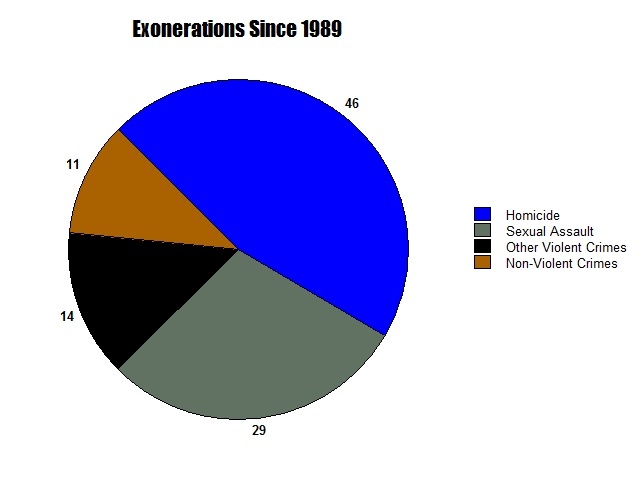 Source: National Registry of Exonerations.